Uncertainty is the NEW certainty – Whats your superpower? The only thing constant is change. You and I have uttered these words on numerous occasions but most times on a very surface level. It’s almost as if when we say the words we feel that it’s all that’s required; that speaking these words alone will inoculate us against dealing with stuff that we can’t handle. Change as we know it has not slowed down. In fact our lives continue to change at a very rapid pace – keeping in line with a world that has become more complex and interdependent. Organizational consultant Peter Vail calls rapid fire change “permanent whitewater,” referring to a time of ongoing uncertainty and turbulence. 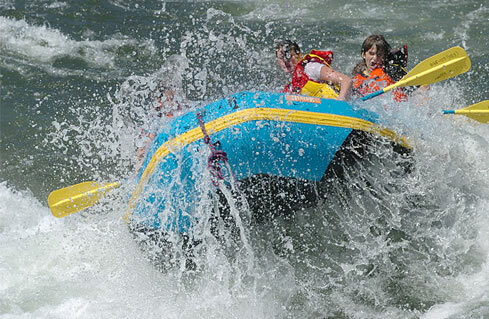 Experienced white water rafters know and prepare for getting dumped out of their raft at some point. In the book “The Art of Possibility” Rosamund Stone Zander describes her first white-water rafting trip. “If you fall out of the boat,” her guide said, “it is very important that you pull your feet up so that you don’t get a foot caught in the rocks below. Think toes to nose, then look for the boat and reach for the oar or the rope.” By the time they had reached to the river’s edge, Rosamund was nauseated having heard “Toes to nose” more times that she cared for. “Someone here is mentally challenged,” she thought as she climbed into the boat, starting downstream. Needless to say, when she vanished into a wall of water where it seemed as if there was nothing – no boat, no anything the words “toes to nose” emerged from a void. She was able to pull herself up into a ball, look for the boat and then look for the oar. Isn’t that how we feel when we’re hit with change especially if we didn’t see it coming? How do we cope with a falloff in business or not being able to live as we used to because we simply can’t afford it? What do you do if your job is rendered obsolete and no one needs your particular skill anymore? What about the huge debt that has accrued because you now have a daughter in rehab? Which is the more stable situation: the job that you’ve had for the last fifteen years with a company that has just been swallowed up by a multinational outfit and experiencing a shrinking profit margin or the opportunity with a start up with seemingly greater risks and rewards? Are you prepared to cope when you’re blindsided by change in your life? If you don’t have “toes to nose” guidance you aren’t going to know how to get back into your boat. And please don’t think that you just need to be strong. Only the strong survive is now a thing of the past. “It is not the strongest of the species that survives, nor the most intelligent, but the one most responsive to change.” Charles Darwin said this almost one hundred and forty years ago. We should have listened. The key indicator to success in life, especially in these turbulent times is to learn how to adapt. “You have to be flexible and resourceful in the face of ever changing conditions” says M J Ryan in her book AdaptAbility. Aikido masters say that to be successful in life, three kinds of mastery are required: mastery with self, which means understanding our feelings and thoughts and how to regulate and direct them; mastery with others, which means being able to create a shared understanding and shared action; and mastery with change, which means having the capacity to adapt easily without losing our center – our values, talents and sense of purpose. Let’s say you’re planning to go to the movies with a friend. She calls at the last minute and cancels. This is by no means a “fall out of your boat” change so you first accept that you are no longer going to the movies, you start thinking about what else is possible for you to do and then you go do it. This believe it or not is the same process for dealing with turbulent change. You must first accept it, then expand – look at the possibilities, and finally take action. As you become more consciously aware of the steps you need to take to work through change you will strengthen your ability to adapt. Experts tell us that people who adapt to change quickly live longer and healthier lives than others. Creativity expert Sir Ken Robinson, speaking at a TED conference said, “We have no idea of what’s going to happen in the future. No one has a clue about what the world will be like in even five years.” When BIG changes hit we panic and sometimes deny that anything is wrong. Then we get angry because we think that the change could not have come at a worse time – why now – why me? And then finally we feel devoid of strength to handle the change. But you can – and you will! You have no choice. Change IS coming your way! Very true. I just re-read “Who moved my cheese?” and you share the same sentiments indeed. If we choose to love Change, then Change can only work for us!! That’s so very true Patti!